The Gates to the Marina will be kept closed because of icy conditions. The gates will be reopened when conditions improve. Parking is available in Lot #13, at the park office and at the fishing pier if you wish to utilize the paved bike trail. Mountain Bike Trails: The Mountain Bike Trails are closed for the season. Please do not ride or run on the trails until they are officially re-opened in 2019. When trails are saturated and visitors ride bikes or run on them, it can create deep divots and ruts that destroy the carefully maintained trail surface. It can take hours of work to repair just a small section. These trails are solely maintained by a small group of volunteers who work hard all year to maintain, repair, and improve our bike trails. Help us protect the awesome resources we have by obeying the closure notice. We will see you again in the spring! The 5,286-acre Nockamixon State Park is in the rolling hills of scenic Bucks County, close enough to Philadelphia for a day trip, but far enough away for a vacation. Tohickon Creek, Three Mile Run, and Haycock Run feed the 1,450-acre Lake Nockamixon, which is a rest stop for migrating waterfowl and a destination for boaters and anglers. Visitors can stay the night in a cabin or enjoy the many activities of the park for the day. Popular activities are picnicking, swimming in the pool, hiking, biking, disc golfing, hunting, fishing, and boating. The park office is open specific hours. Fishing and boating is permitted 24 hours-a-day in designated areas. Some park areas are closed to vehicles in the winter. Contact the park office for facility seasons and hours. Nockamixon State Park is along PA 563, just off PA 313, five miles east of Quakertown and nine miles north of Doylestown. The main entrances are along PA 563 and can be reached via PA 309 and PA 313, or from the north from PA 611 and PA 412. 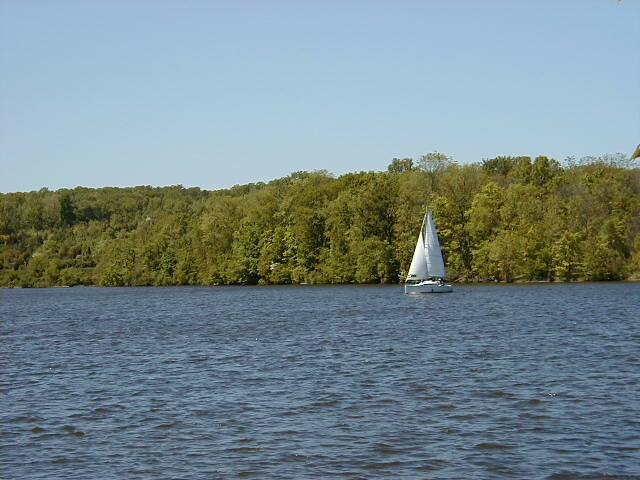 Nockamixon State Park offers a wide variety of environmental education, interpretive, and recreational programs. Through guided walks, hands-on educational activities, children’s programs, and evening programs, visitors gain appreciation, understanding, and develop a sense of stewardship toward natural and cultural resources. Programs are offered late spring through fall. The Environmental Education Center is only open for programs. Teacher workshops and educational programs for schools are available. Please contact the park office for more information. Pontoon boat tours of the lake board at the marina. These tours provide a history of the park and views of wildlife and beautiful scenery. Preregistration for the boat tours is required and starts in early April. Please contact the park office.